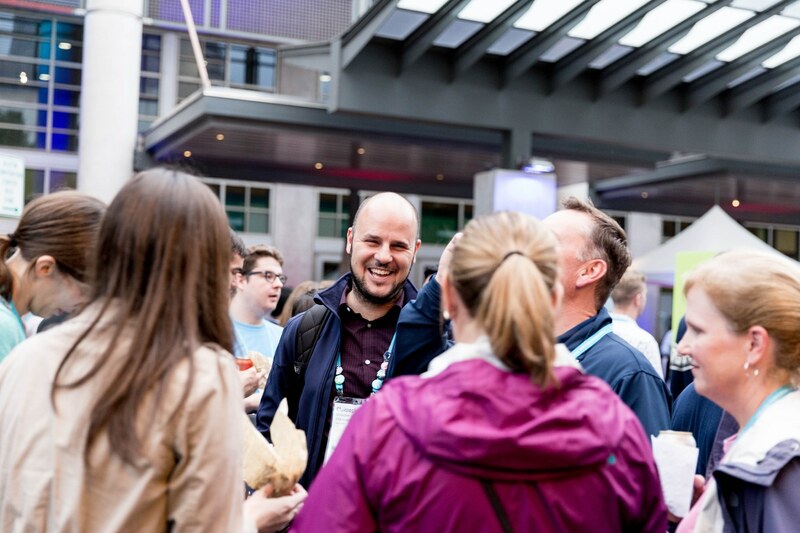 If this is your first time at Tableau Conference, you’re probably wondering how to make the most of four days amongst your fellow data lovers. We’ve all been there—and we’re here to help. But first, we want to send our deepest sympathies to those affected by the recent tragic events in Las Vegas. As the Tableau Community comes together, we want to share all of the ways you can lend support and get involved. Contribute to your local blood bank. Visit redcrossblood.org to find a donation station near you. Support the victims and their families through the National Compassion Fund. Join the community of data people doing good. Follow the #data17donates on Twitter to join a giving activity or plan your own during next week’s conference. In addition, here are five tips to help make your first Tableau Conference experience a memorable one. 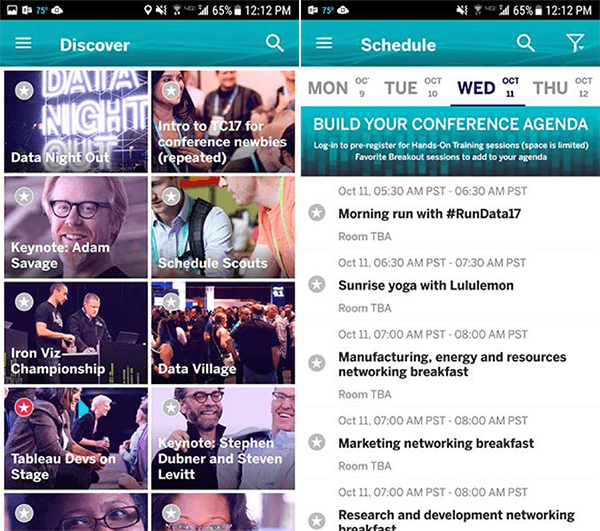 The Tableau Conference mobile app will be your one source of truth for everything Tableau Conference! TC17 features more than 300 breakout sessions including 80 customer sessions, 100 hands-on trainings, 6 keynotes, and the ever-popular Tableau Doctor appointments. Planning ahead is crucial to maximizing your time. In the app, “star” breakout sessions to add them to your custom agenda. You can even export this schedule to your phone’s calendar for added convenience. Please note that starring breakout sessions does not secure a seat, so if there’s a “can’t-miss” session on your agenda, make sure to show up early. If you’re unable to attend a session due to a scheduling conflict, don’t stress! All sessions are recorded and accessible after Conference. You can expect to attend between three and eight sessions per day, depending on the session type. But as Bridget Cogley wisely noted, make sure you’re accounting for some downtime to pick up a snack in Data Village or chat with other attendees and sponsors. Your feet will thank you! Need help planning your schedule? Schedule Scouts can help you navigate the wide world of conference sessions! Schedule Scouts are located on South - Level 1 of the Mandalay Bay Convention Center. Find the exact location on the map in the mobile app. Book trainings and one-on-one appointments: There are plenty of opportunities to learn at Conference. Attend a two-hour hands-on training led by Tableau trainers or a day-long training workshop (additional fee) to advance your skills. These trainings require advanced booking and fill up fast, so reserve your spot in the mobile app as soon as possible! Schedule a 45-minute Tableau Doctor appointment to meet one-on-one with a Tableau expert. If you just need a quick fix, you can also visit the Tableau Doctor Walk-In Clinic or stop by the Minute Clinic when it’s convenient for your schedule. Pack your bags: You’ll see all types of clothing at TC, but since you’ll be in the company of thousands of data fanatics, there isn’t a better place to rock your favorite Tableau t-shirt. Don’t have any Tableau swag? The Tableau Store in Data Village is the perfect place to score some. If you prefer to start your day with a sweat, we’ve got you covered. Bring your workout gear for Sunrise yoga with Lululemon and comfortable shoes for happy TC feet and morning runs with #RunData17. Get social with the community: Join the conversation with #data17 on Twitter and follow Community champions to get a pulse for all things TC17. Not sure where to start? Our Ambassadors and Zen Masters are Tableau Conference pros and often post insider tips to help you make the most of the week. Meetups are a great way to find your people at TC17. With meetups for Healthcare, Finance, Marketing, Fanalytics, and more, there are countless ways to join the conversation. These are first come first serve, so get there early. Connect with the inspiring Tableau Community during the loads of community-driven events at TC17, including the Tableau Community Meetup, Makeover Monday, or Data + Women–or drop by the Community Center in Data Village for a quick conversation (or photo booth moment). Visit Tableau Labs to chat with Tableau developers, watch demos, and get the chance to impact the future of Tableau. Drop by during the open house at Welcome Reception to get a closer look into the various activities going on throughout the week. Mingle with partners, sponsors, and people in your industry at the Welcome Reception—our Conference kickoff celebration. Navigating Mandalay Bay: With the sheer amount of activity at Conference, there is a lot of ground to cover. Allow at least 15 minutes to walk between breakout sessions in the north and south convention centers. Check breakout session locations in the app and account for long travel distances. For some fun post-Conference vizzing, bring your fitness tracker to track your steps! Conference Shuttles: Need a lift? Shuttles are provided to and from Tableau Conference hotels and the Mandalay Bay Monday through Thursday. Drop off and pick up from Mandalay Bay is located outside of the Shark Reef entrance of the convention center. 5. Attend a newbie session! Eager to learn more? Attend the Intro to TC17 for conference newbies session to get the inside scoop from Dustin Smith, a Tableau and TC veteran. This session will repeat throughout the day on Monday. All of this information (and more) is at your fingertips in the mobile app! Be on the lookout for emails from the Tableau Conference team for more “know before you go” tips. Until then, see you in Vegas!